Last year the blog featured something scary for Halloween, but scary is no longer politically correct, so this year I have something orange. Not that I pay attention to correctness when it comes to cooking, but last year’s post, you would not have wanted to eat, cook or even see. So there is something creamy and soft that will go smoothly on Hallow’s eve. It is best not to use regular pumpkin as their meat barely has any taste, but otherwise you can mix any kind of squash. 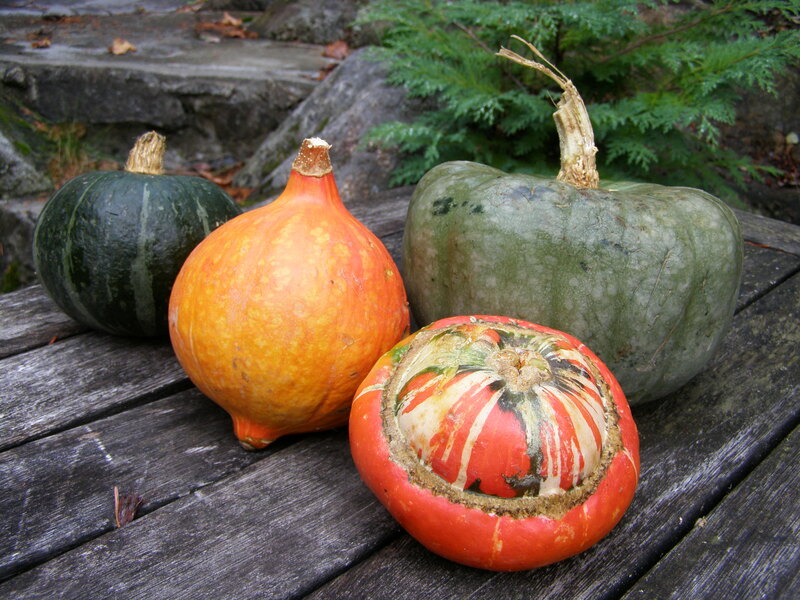 For the bright orange colour, you are best to include orange hubbard squash or at least kabocha, more yellow. 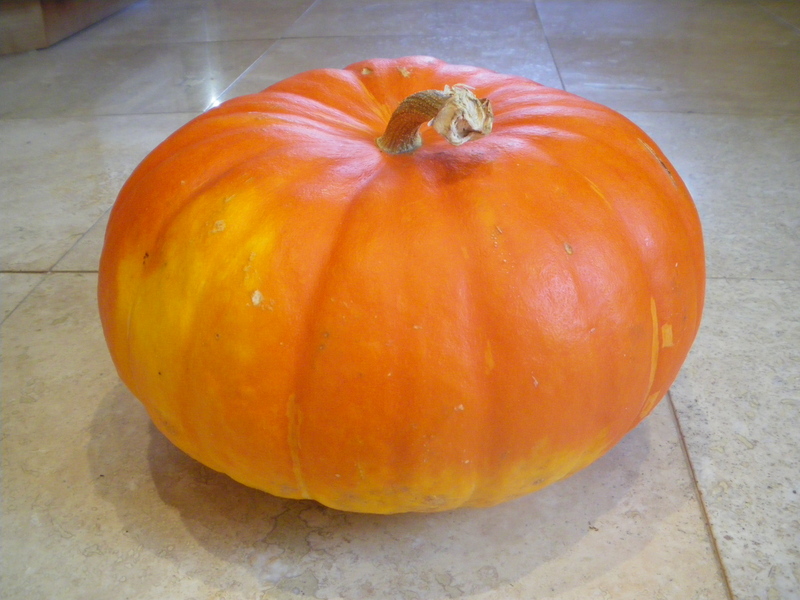 However, the very best choice is: The Pumpkin French Cinderella, ‘Cucurbita maxima’, a beautiful French antique heirloom with vibrant mahogany-orange skin that transformed into a coach for Cinderella. The French Cinderella is also called Rouge Vif D’étampes. The quantities are not very important for this. For four, you need about the equivalent of 6 cups of diced squash. First, peel the squash and remove all the seeds. Best to use a Y shaped potato peeler and to wear rubber gloves for that. Then dice the pieces. Cook in olive oil with 2 peeled apples (any variety) , a clove garlic, thyme and salt, for 20 minutes. Mash with a food mill or a fork and add one beaten egg, about 1/2 cup hot whole milk, sour cream, 10% or heavy cream. Basically you choose how much you want to indulge with the cream! You must however add one cup of grated Gruyère or Swiss cheese. Bake in the oven for 20 minutes on 340. 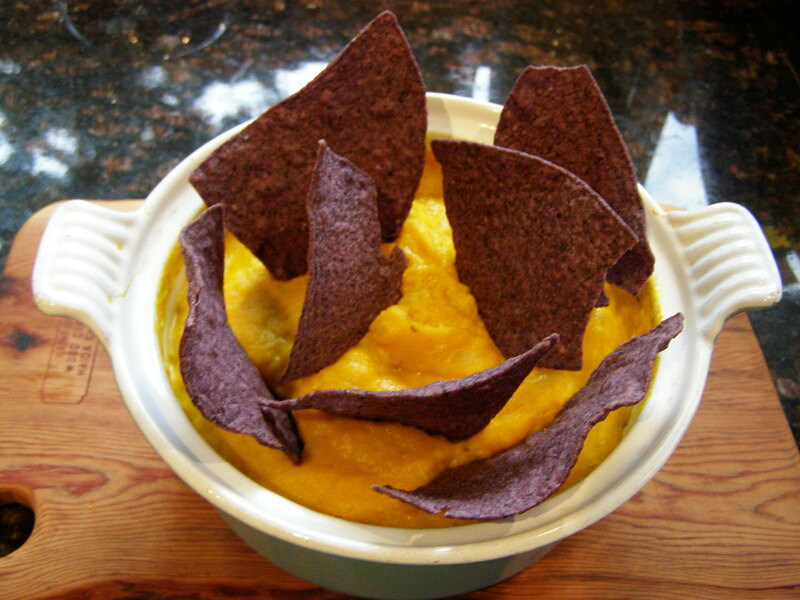 You may add lardons and garlic croutons, but on Halloween, I opted for blue corn chips, just because. This entry was posted in Vegetables, Vegetarian and tagged food, halloween recipe, hubbarb, kabocha, pumpkin gratin, recipes, squash au gratin, vegetarian, verygoodrecipe. Bookmark the permalink.